Malbec and Tannat are popular around the world but it's in the their homelands, Cahors and Madiran, where the grapes truly thrive. 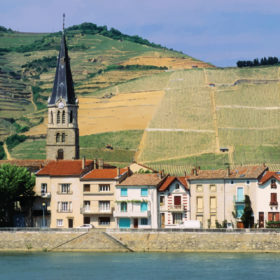 Southwest France is rich in indigenous grape varieties. Of the 300 or so total varieties cultivated throughout the region, more than 100 are native to the area. Many of these stay right at home, but two have become especially prominent on the international stage: Malbec and Tannat. Both varieties have traveled abroad. Most notably, they’ve succeeded in South America, where Malbec found a home in Argentina, and Tannat settled in neighboring Uruguay. They’ve also taken root in Australia and the U.S., where their relevance has been on the rise in states like California and Washington. But their homeland in Southern France continues to be where the grapes truly thrive, in the regions of Cahors for Malbec and Madiran for Tannat. Roughly 100 miles apart, the two Appellations d’Origine Protégées (AOPs) produce great red wines that demand respect, whether they are value bottlings designed for immediate, everyday enjoyment or bold blockbusters that are built to cellar for decades. These regions, both founded on old traditions, now embrace attention worldwide while honoring their origins. In Cahors, the past two decades have brought the arrival of new money and talent, with local pioneers gaining knowledge and international dimension. Madiran has moved more slowly, but its wines have increased in finesse and depth. While some top-end Cahors bottlings have become expensive, there’s great value in both regions for $30 and under. You’re going to love these wines for their authenticity and sheer drinking pleasure. Château Lagrézette 2015 Le Pigeonnier (Cahors); $290, 95 points. This single-vineyard wine—named after the classic pigeon house located near the vines—is bold in black fruit and spice tones, with a huge, dry and tannic structure from wood aging. There is a real sense of power and great concentration, making this an ageworthy wine. Drink from 2024. Curious Cork Imports LLC. Cellar Selection. Vignobles Brumont 2014 Château Bouscassé (Madiran); $25, 94 points. From the home estate of the Brumont family, certainly the leaders in Madiran, this wine is dominated by Tannat, with additions of Cabernet Franc and Cabernet Sauvignon. The blend produces rich tannins and broadens the palate to bring in a black-currant flavor, with a crunchy, juicy texture. This wine will age well and should be ready to drink from 2023. Regal Wine Imports Inc. Editors’ Choice. Jean-Luc Baldès 2013 Clos Triguedina Les Selections Parcellaires Les Galets (Cahors); $49, 94 points. This third-terrace parcel in the Baldès terroir Trilogie is clay and limestone with iron and lava deposits. The wine presents a rich medley of black fruits, ripe tannins and a powerful structure. It has concentration, ripe fruit and bright acidity. Drink from 2023. Vineyard Brands. Cellar Selection. Malbec may have migrated to Argentina, but first, it was grown in Cahors. The grape is still rooted here, and the locals, the Cadurciens, don’t want you to forget it. This is the original Malbec, and that slogan is everywhere in the region. Malbec and Cahors are inextricably intertwined. Producing a magnificently structured red wine, the grape finds both its spiritual home and arguably its finest expression in the Lot Valley of Southwest France. It’s a spectacular landscape: The Lot river carves a deep valley through the region’s hilly terrain, with the valley floor offering a mix of vines, small stone villages and massive castles. The river and its tight loops make it occasionally difficult to tell whether you are on the south bank or the north. At the eastern end of the vineyards, the city of Cahors boasts a richly decorated medieval cathedral and a stern 14th-century fortified bridge, the Pont de Valentré, that crosses the Lot. Vineyards cover a relatively compact area of about 10,000 acres. It takes no more than 45 minutes to drive from one end to the other. But within that, a number of Malbec-based wine expressions can result, which depends on where the vines sit in relation to the river. “The style of Cahors has changed from body-building wines to something more elegant and sophisticated,” says Pascal Verhaeghe, second-generation owner and winemaker of Château de Cèdre. The shift is not just stylistic, but also comes from close attention to where the grapes are grown. Cahors producers talk about wide terraces of vines that rise up in layers from the river as a key factor for wine production. “Each terrace has different soils and wine styles,” says Jean-Luc Baldès, owner and winemaker of Clos Triguedina. “The closest terrace to the river makes light wines ready to be drunk early. It’s the least interesting. Baldès’s Trilogie Single Vineyard Selection, which consists of three bottles sourced from the second, third and fourth terraces, is a fascinating panorama. This is a fixed picture that’s dictated by geography. But there’s a move afoot that could complicate matters. It’s been proposed to create two distinct Cahors appellations: one for the valley and the first three terraces, and another for the fourth terrace, the upper slopes and the plateau above that. A few growers, like Verhaeghe, are in favor. But it appears that the majority is dead against the proposal. “I am not in favor of these different appellations,” says Bertrand-Gabriel Vigouroux, one of the most prominent producers in the region. He owns four chateaus and a luxury hotel, the Château de Mercuès, which is part of the Relais & Châteaux hotel brand. “It shouldn’t be for bureaucrats to decide the terroir, it’s for the wine producers. Having two appellations will make it difficult to blend between different terroirs, as everybody does at the moment. While there may be conflict within Cahors, it could be a positive sign. It signals the region’s effort to assess and take control of its future, a move to re-assert itself as the home of Malbec in a wine world that already knows the grape, but now needs to embrace its origins. Clos Troteligotte 2015 K-2 Malbec (Cahors); $55, 94 points. This is the top bottling from this organic estate. An impressive wine, it boasts rich tannins, powerful fruit and dense concentration. Black fruit flavors are laced with acidity on the firmly structured palate. This wine deserves to age, so drink from 2023. Elixir Wine Group. Cellar Selection. Château du Cèdre 2015 Le Cèdre Malbec (Cahors); $60, 93 points. This is one of the top wines from this estate, a leading light in Cahors. It is structured, firm from tannins and wood aging. But the wine is also about the organically grown fruit, juicy acidity and final blackberry flavors that form a beneficial contrast to a structure that needs to soften. Drink from 2023. Martine’s Wines. Cellar Selection. Paul Hobbs & Bertrand Gabriel Vigouroux 2014 Crocus La Roche Mère Malbec (Cahors); $125, 93 points. The top wine in the range made in a joint venture between the Bertrand Vigouroux family of Cahors and Sonoma winemaker/consultant Paul Hobbs, this wine is hugely dense. It has powerful tannins along with opulent black fruits and serious concentration. Expect this wine to age for several more years. Drink from 2023. Paul Hobbs Selections. Cellar Selection. Domaine de Cause 2015 La Lande Cavagnac Malbec (Cahors); $42, 92 points. From vines planted in the 1970s, this wine is the top cuvée of this estate. Rich tannins, generous fruit and good acidity combine to give a powerful, wood-aged wine. It is still young, with a burst of great fruit that needs to soften. Drink this impressive wine from 2022. DHI Selections. Editors’­ Choice. Les Vignobles de Saint-Didier Parnac 2016 Latis Grande Réserve Malbec (Cahors); $30, 91 points. The 12 months in wood have contributed to the richness and density of this complex wine. With firm tannins, sweet blackberry fruits and good acidity, the wine is already appealing, but it needs time. Drink from 2021. Misa Imports. Georges Vigouroux 2016 Gouleyant Malbec Red (Cahors); $12, 88 points. This is classic Malbec, with tannins plus rich black fruits. Touches of spice as well as youthful fruitiness, acidity and crispness give a wine that is delicious to drink now. Multiple U.S. importers. Best Buy. Tannat is a wild grape that produces massive, heavily tannic wines when untamed. Vinified correctly, however, it produces some of France’s finest red bottlings, and producers in Madiran have mastered how to work with the variety. Madiran is beautiful. In a network of steep hills and tight valleys within sight of the Pyrenees mountains that divide France from Spain, the appellation yields wines of astonishing raw intensity. Vineyards of Tannat, Cabernet Franc and Cabernet Sauvignon descend the slopes beneath lush forests of oak trees. On the flatter land beneath, farmers grow corn for animal feed. A 30-minute drive from north to south, Madiran is home to around 3,700 acres of vines, with the northern section of the region more widely planted than the south. It’s here that the big man of Madiran, Alain Brumont, has his home in Château Bouscassé. In the appellation, he owns a total of 700 acres that include Madiran’s showpiece estate of Château Montus. Brumont is widely credited in Madiran for leading its revival. He has made it his life’s work to spread the gospel of Tannat and, in the process, identify the best land for vineyards. And age it can—20 years or more, in the case of Brumont’s single-vineyard La Tyre and Montus XL. Don’t dismiss older Madiran vintages. The highly tannic character of Tannat and its effect on the production of wines that can be enjoyed younger was behind one of the region’s great developments, micro-oxygenation. The technique bubbles a stream of oxygen into fermenting wine to soften its tannins, which is now used by winemakers around the world. It was developed here in 1991 by inventor and consultant Patrick Ducournau. Over the years, Madiran winemakers have cut down on grape extraction and the use of new wood. Producers treat Tannat almost gently, like they would a white wine. The effect on the wines has been dramatic. Today’s Madirans are still largely rich wines, with supporting structures in place and singing black-fruit characteristics. Many producers make two styles of wine: one soft and generously fruited, the other bold and firmly structured, suitable for medium- to long-term cellaring. Château Peyros’s entry-level wine is full of soft, generous black fruits that can be enjoyed young, while the winery’s Cuvée Greenwich, so called because the vineyard sits on the zero longitude line, or Greenwich meridian, boasts gripping tannins around a core of bold and ripe dark fruits. At Château Aydie, the Laplace family makes Aydie l’Origine to be enjoyed young, which is fruity and full of berry flavors. The family also makes the big, ripe and concentrated Odé d’Aydie, which shouts out its structure when young. Similarly, Château Viella has its soft, approachable Tradition bottling as well as its rich, dark Expression offering. Tannat is a grape that finally, in the 21st century, has revealed its potential. And Madiran is a magnificent, worthy addition to the roster of world-class wines produced today. Château Peyros 2014 Vieilles Vignes Tannat-Cabernet Franc (Madiran); $19, 93 points. This powerful and dense wine has both impressive tannins and great black fruits. It is rich with black-plum-skin and dark berry flavors. The concentration of low-yield vines is lifted by the acidity and final rich fruitiness. Age this major wine and drink from 2021. Baron Francois Ltd. Editors’ Choice. Domaine Berthoumieu 2014 Cuvée Charles de Batz Tannat-Cabernet (Madiran); $25, 93 points. This is a bold, structured and firm wine, full of dark tannins and ripe fruit. It has power and a dark presence that comes from the dense texture and the dry core that is still a powerful element in the wine. That means that the wine needs to age further. Drink from 2021. Charles Neal Selections. Château de Gayon 2011 Dou Barrinquet Red (Madiran); $38, 93 points. Now approaching maturity while still packed with black fruits, this is a rich, dense wine from David Ebert, a Chicago architect who found the property while cycling Madiran’s southern boundary. Its tannins are dusty, as ripe as the juicy black-plum fruits and spice. Perfumed and concentrated, it’s ready to drink now or keep until 2020. Jom Wine & Spirits. Cellar Selection. Famille Laplace 2015 Odé d’Aydie Tannat (Madiran); $38, 93 points. This is pure Tannat: big, ripe and concentrated. Its weight and richness are palpable, with swathes of black fruits as well as the impressive tannins. This wine shouts out its structure, dense texture and generous fruit. Give it space. Drink from 2022. The Wine Company. Editors’ Choice. Producteurs Plaimont 2015 Crouzeilles-Côte Abeilles Tannat-Cabernet (Madiran); $65, 93 points. This is an impressively ripe and solidly fruity wine. Blending mainly Tannat with Cabernet Franc and Cabernet Sauvignon, it is certainly structured. But it is the brilliant black fruit that gives this wine its real character and density. It is impressive, and obviously made for the long haul. Drink from 2021. Jerome Selections. Cellar Selections. Lionel Osmin & Cie 2016 Mon Adour Red (Madiran); $18, 90 points. Blending Tannat with the two Cabernets, this wine is rich and not too firmly tannic. It’s ripe with black fruits, licorice and layers of spice and vanilla from wood aging. This succulent wine is ready to drink now. Vintage Imports Inc.